Enthusiasm is spreading “virally” through Millennial voters motivated by #MeToo and reproductive freedom. The Trump effect has created a surge in voters’ support for reproductive rights, and across all demographics, a majority of women are very likely to encourage friends and family to vote – including 73 percent of African-American women, 53 percent of Latinas, and 55 percent of Millennial women. 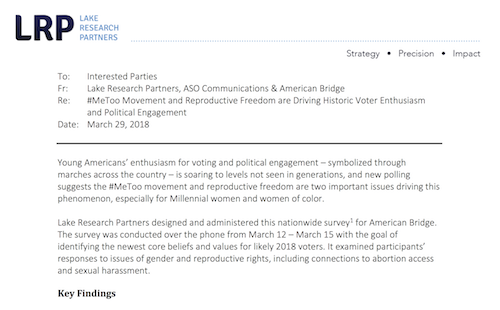 Lake Research Partners designed and conducted the nationwide survey of likely 2018 voters for American Bridge.